I need this. How do I buy it? Will you ever be selling the pcb for this? Just got this while visiting Berlin. Really dig the sounds one can get from it. Just a question bout CV’s. I tried to feed gate and oct/V signal with a plug into CV port but it machine only reacted on signal coming from the tip. Is it possible to feed to different signals through one plug (both oct and gate) or is it possible to add more audio jacks for CV gate. The Nandamonium is only capable of taking the CV inputs through the tip of the jack, as the sleeve connection goes straight to ground. We haven’t messed around with modding it to take more either, though I’m sure it is probably possible. If you figure anything out, feel free to post it up here. 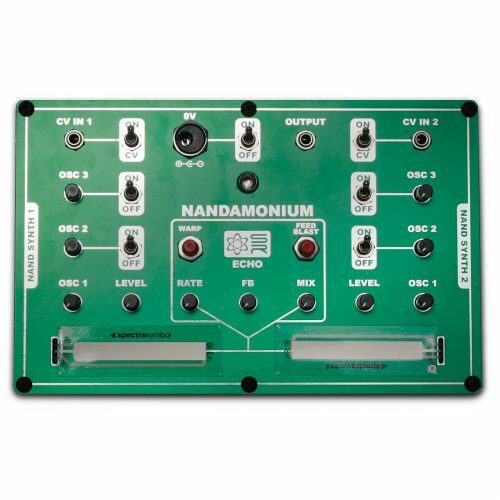 What is the CV voltage range input for the Nandamonium? to stay on the safe side, I would limit cv input to 0-5v. 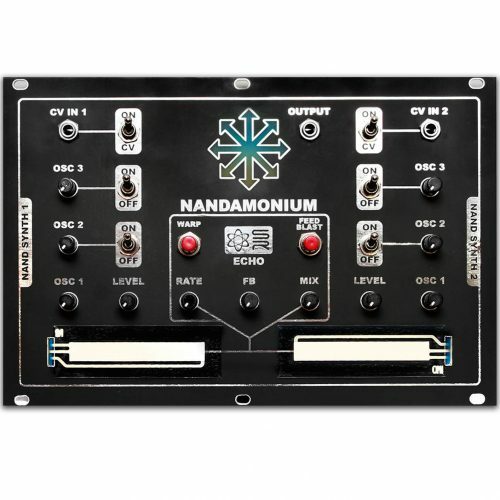 Can I buy labels to mark out the Nandamonium’s controls from Synthrotek or do I have to print my own? We do not sell labels for the Nandamonium. If you bought our completed version you would get the artwork and enclosure. As a kit it is left up to you to label it however you would like! Using the CV ins and coming from a keyboard with pitch cv out, can this be played as a mono synth rather than drone? The CV input is not 1V per octave so using a keyboard would be fun but not what you’d expect from a 1V per octave module. this thing is fun! but I’m not sure if my build is totally working ‘correctly’: are both LED’s always supposed to be ON when the power switch is on? (that’s how this one is working). And is the CV switch action correct? : I only get sound in the CV ON position; when switched off sound trails off with an upward pitch. Thank you! This does sound like a strange issue. Would you be able to send a video of what you’re experiencing to store@synthrotek.com. Seeing the issue for myself should hopefully allow me to isolate the issue.